This is basically Rice Chex cereal with bits of oats and dried fruit adhered to most pieces by a light sugar coating. 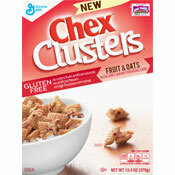 The variety I tried was called Chex Clusters: Fruit & Oats. Overall, I liked it quite a bit. The Chex pieces have more of a crunch when coated in the sugar. The bits of "real fruit pieces, rice crisps and rolled oats" made this cereal feel more hearty than traditional Chex. The different textures are most notable after the cereal has set in milk a few minutes. 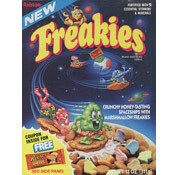 The cereal tastes distinctly fruity. The berry flavor reminded me of blueberry and raspberry fruit roll-up snacks. With this cereal, General Mills is playing kind of loose and fast with word "clusters". 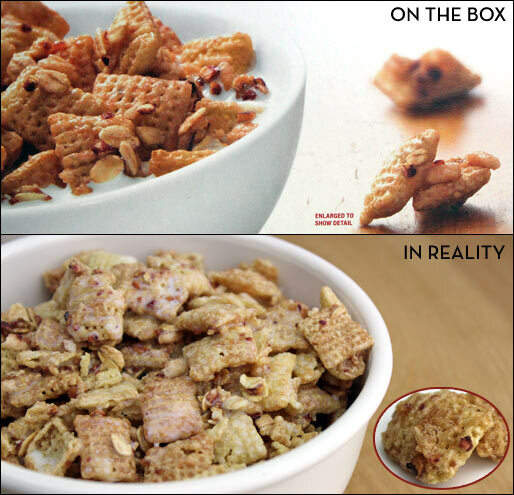 A few specks of oats and fruit sticking to a piece of cereal is not a cluster. It would be fun to see what this cereal would be like with actually, distinct crunchy oat clusters, but for now this new cereal will do fine. What do you think of Chex Clusters? I love this cereal for breakfast and also as a late night snack. I didn't like it. Too sweet... needs less fruit and more oats.